A new, modern design approach inspired Becker Oregon to combine the conveniences of a modular system with the rigidity and lightweight characteristics of composites to create a laminated system that is user-friendly to the practitioner. The laminated sections of the orthoses are now fabricated around the metal components and attached with screws. Lightweight—typical KAFO weighs only 2.6 lbs. Components can easily be detached for fitting, adjustment, and replacement. Ohio Willow Wood's custom-fabrication department provides high-quality craftsmanship and prompt turnaround for prosthetic-fabrication jobs. Customers can supply plaster casts for fabrication orders. Orders may also be submitted by phone, fax, mail, or via CAD, either as OMEGA Tracer® files or AOP files. 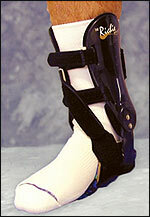 The Richie Brace® is an innovation that needs no introduction. SPS has all Richie Brace configurations available, from the original Richie Brace Standard® to the new Richie Gauntlet™. The custom ankle-foot orthosis designed to treat chronic conditions of the foot and ankle, the Richie Brace provides ideal stabilization of rotational forces at the midtarsal, subtalar, and talocrural joints. These functional braces incorporate contoured, balanced orthotic footplates articulated to adjustable, semi-rigid, lower-leg uprights. They also provide versatility in treating sports injuries as well as debilitating degenerative pathologies of the foot and ankle. The Model 2009 Automatic Ring Lock Knee Joint is a non-protrusion knee joint that combines the simplicity and security of a standard drop lock with automatic locking. When joints reach full extension, the rings are automatically engaged by springs that are internally housed within the midsection. This feature gives the user the convenience of automatic locking. Original StepLock® and InterLock™ are now compatible with the new Rod Style Bail Kit (RBK) from OTS Corporation. Easy to fabricate, the RBK allows the addition of a bail without the need to braze two pieces together. It is shipped with all the parts and tools you need to make a nice-looking bail kit and is less expensive than an SBK kit. Order from your favorite distributor, or call OTS customer service. The new low-profile i-LIMB Hand provides a significant benefit to female upper-extremity amputees as well as smaller-framed men. The low-profile i-LIMB Hand is approximately 2.5 percent shorter in length and 14.6 percent smaller at the wrist than the small hand. It is available in natural or black, with options for standard, wrist-disarticulation, above-elbow, or single-site alternating control. Additionally, the new slim-line battery allows each cell to be positioned either side-by-side, one atop the other, or separated by 135mm within the socket for maximum patient comfort. Skinergy Plus™ sets a new standard for silicone belowknee cosmeses. Reinforced with integrated mesh and advanced silicone materials, the new cosmetic covers provide significantly greater durability, appearance, and enhanced bond to the brim. Now available in 19 color shades with unique True Finish™ micro-pigmentation for a realistic look in split or closed toe. Contact us directly, or contact a distributor to request a new True Finish color-swatch kit. Endolite feet ship fully assembled and include the glide sock where applicable. 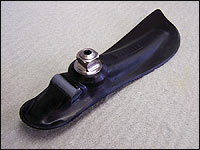 The foot shell will continue to be supplied in either the light or dark tone with the purchase of these feet. Foot shells are also available for individual purchase. Now you can have a choice. 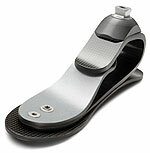 OPTEC is offering the revolutionary Stealth and Vertamax orthoses in new, appealing colors. The Stealth and Vertamax will be offered in white and beige respectively. Both spinal systems will continue to be available in black. The Stealth and the Vertamax continue to offer superior support and comfort, which your patients deserve. Call today for a free 30-day trial sample of the Stealth and Vertamax. The Element Foot™ from Fillauer was designed to support each phase of the gait cycle, from heel strike, to mid-stance, to toe-off, resulting in unsurpassed smoothness, stability, and performance. The system kit includes foot, heel bands and elastomers, Spectra® sock, and instruction manual. Smooth rollover and superior stability. Natural gait cycle and fluid rollover. 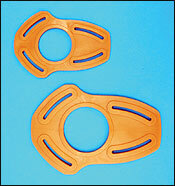 Interchangeable heel elastomers for fine tuning heel stiffness. Modular design with superior flexibility. Low-profile design requires only 3.75 in. clearance (9.5cm). Start off the right way-give toddlers an orthosis that allows their little feet to move in a natural gait pattern. KiddieGAIT, manufactured by Allard USA, provides a carbon-composite framework to build an orthosis that encourages functional heel-to-toe gait. While an SMO (molded inner boot) or UCB controls the foot, KiddieGAIT's floor-reaction frame adds dynamic response and lower-leg anterior support and stability while providing an opportunity to manage the knee-extension/flexion moment. This combination allows customized function to meet specific patient needs. KiddieGAIT is available at all SPS distribution centers nationwide. The T-Scope Elbow Brace is ideal for fixed or controlled range of motion for the treatment of ligamentous injuries or stable fractures of the elbow or upper arm. 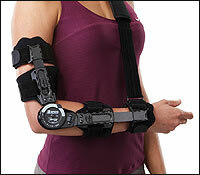 Manufactured by BREG, the T-Scope Elbow Brace is the lightest (13 oz.) post-op elbow brace on the market. Telescoping forearm and humeral struts to accommodate varying arm lengths. Extension control from 10-degree hyperextension to 110 degrees. Flexion control from 10-120 degrees. Customizable pads and straps for trimming to fit various arm sizes. Available in regular or long. Call for additional sizing information. The Model 1017 Automatic Angled Lever Lock Knee Joint is a modular lever-lock knee joint with a locking mechanism that will automatically engage when the joint reaches full extension. 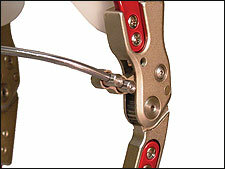 The long, angled lever is easily operated by the patient and can be shortened or contoured to suit individual needs. In addition, Model 1017 comes with an optional anterior pull-cable that allows the patient to simultaneously disengage both locks when necessary. With one of the largest and most extensive selections of diabetic and orthopedic footwear, stepping in style and has never been so easy! Our footwear stock includes BoxerDogs, Mt. Emey, and Answer2. We also offer Medicare-approved custom diabetic inserts, as well as toe fillers, prefabricated diabetic inserts, and other products pertaining to diabetic foot management. We guarantee value pricing, huge product selection, and a commitment to excellent service you have to experience. Our 2009 catalog is available. Orthofeet is offering a large collection of stylish Fisherman shoes that combine all the biomechanical features with superb breathability. The upper's unique design allows the shoes to stretch at the forefoot area, easing pressure on bunions and accommodating swollen feet. Padded fabric lining that offers excellent comfort and protection. 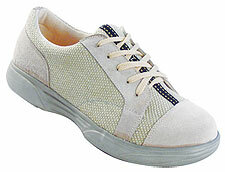 Wide toe-box that offers extra room for toe movement. Two removable spacers that ensure a customized fit. 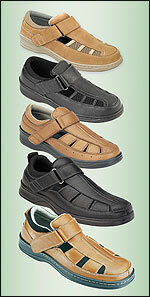 Ergonomic cushioning sole that provides a functional toe-spring. TRS introduces two new, redesigned BAHA models-the original adult model and the brand-new pediatric size. BAHAs completely replace the steel ring in an N.W. 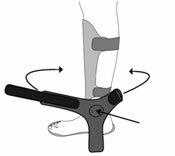 Figure 8 harness, improving the system by opening up the axilla loop and lowering the path of the cable-control strap for better biomechanical control of the terminal device. The new, curved-slots design provides more versatility in altering the harness angles, improving patient comfort and function. Constructed of high-strength, flexible polymers in TRS tan color. Dycor's new "K Series" K3 Energy Storing foot relies on plantar compression of rubber bumpers and dorsi-deflection of a semiflexible keel. This combination provides an ideal platform that is nearly identical in function to Dycor's FDS Energy Returning foot (with the exception of a firmer forefoot) and is best suited for unilateral and bilateral unassisted ADL (K3). Weight limit is 99-259 lb., depending on size. Weight of foot is 7 oz. including integrated EVA foot shell. Patent and patent pending.